Until 2011 Kick To Kill were a band who remained Scotland’s best kept secret. Live shows have provoked stunned reactions, with reviewers recognising that for once this could be a genuine successor to greats like Joy Division, Jesus and Mary Chain and The Stooges. Recent single ‘Black Kisses’ saw the band emerge as ones to watch for 2012. Support slots have included The Fall, A Place To Bury Strangers, The Damned and John Cooper Clarke. New single ‘Avalanche’ represents another significant advance. 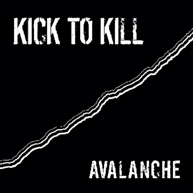 With a killer debut album set for release later this year, 2012 could be the year for audiences to discover Kick To Kill. Radio play has included Tom Robinson, Jim Gellatly and stations around the globe. The single is out 14th May on limited edition vinyl replica cd and download.